A Morecambe hotelier, Syed Masood Ahmed has been sentenced to 8 months imprisonment, suspended for 2 years, after pleading guilty to 12 charges under the Fire Safety Order. The charges were brought following an inspection by Lancashire Fire and Rescue Service which took place on 6th October 2016. 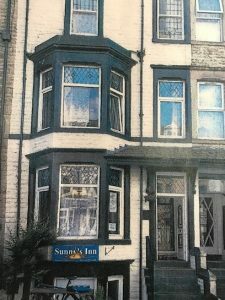 The case involved numerous fire breaches found at Sunny’s Inn, 31 West End Road, Morecambe, which was operated as a hotel and house of multiple occupancy. Warren Spencer, prosecuting, told the Preston Crown Court that there were a number of failures on the part of the Defendant, which failures put numerous residents at risk, in a hotel run by the Defendant. There were, the Crown said, deficiencies in the planning in the event of a fire; the state of compartmentation; protected escape routes; the evacuation procedures and the fire detection within the premises. Mr Spencer said that the absence of a fully functioning fire detection and alarm system would have delayed the response to a fire by anybody within the premises. The fact that the fire separation and compartmentation throughout the building was compromised by fire doors being wedged open, doors not fully functioning due to being defective or through lack of maintenance of separating walls or defective glazing meant that any fire and the products of combustion would have been allowed free passage along the escape routes. Trip hazards and obstructions on escape routes would have compounded the problem. As such relevant persons would have struggled to make their way safely along theoretically protected routes and could have been trapped in the building. Sentencing Ahmed at Preston Crown Court, Mr Recorder Duck QC stated that Ahmed had taken a calculated gamble which had placed employees and residents at risk of death or serious injury and despite numerous visits by the fire service, which had resulted in enforcement notices and action plans. The defendant had adopted a pattern of reactive repairing and negligence. Recorder Duck QC stated that the consequences were potentially appalling. Ahmed was also sentenced to 120 hours unpaid work and ordered to pay costs of £10,752.